Great exercise bike. Weight capacity up to 300 lbs. Adjustable seating for any user whether they are tall or short. 9 different height positions. Provides a safety workout when pedaling. Weighted and counter balanced with adjustment straps. The bike comes with the basic console that is very easy to operate. Does not take up much space when in use. It is hard to find too many faults of this bike. The seat is little hard, It is the same seat that physical therapy had. But don’t worry. You can buy a seat cover from Amazon & enjoy it. Accessory holder is not available. There is no backrest. It will be better if it’s designed with a nice backrest. This Marcy me 708 is an upright exercise bike which has multiple nice features. These features can accomplish your most of all major requirements even at a very low price. Construction of this bike is very strong, stable and also quiet. This exercycle builds up with 14-gauge steel tubing that can hold up almost 300 lbs and weight is 41 lbs. Marcy me 708 has a magnetic type resistance system and also the resistance is adjustable. You can adjust the tension level from easier to more difficult manually which is 8 levels. It has an ultra-functional 2.25 LCD monitor to read time, speed, odometer, distance in miles and also calories you burned. This bike’s seat is very standard and also adjustable with 9 different height positions. You can easily get on and get off from the seat. The pedals have adjustable straps due to maximum support you from any slippage. The pedals are very smooth and also quiet that can satisfy you. The Marcy me 708 cardio workout designs with magnetic type resistance mechanism. The resistance system is adjustable so you can increase or decrease the resistance depends on your fitness level. It has 8 levels of resistance which are very smooth when you exercise. You can adjust the tension level from easier to more difficult as per your need. There is a knob under the handlebar that helps you to adjust the tension. The higher number is the more resistance. This exercise bike has 2.25 inches standard LCD display. By this display, you can read easily read time, speed, odometer, distance in miles and also calories you burned. You will be able to reset any mode of them like time, speed, odometer, distance and also calories burned. The LCD display also shows the result accurately. The display is near to handles so it’s easy to display the results. This exercise bike designs with 14-gauge steel tubing which is 2 inches x 2 inches round. Power coat also uses the steel gauge to protect from tarnish. The combination of design and performance is perfect. This bike can hold up about 300 lbs weight even its weight is only 41 lbs. Its heavy design makes it stable, sturdy and also quiet when you exercise. It will satisfy you with its functionality and durability. This bike designs with comfortable handlebars so that you can exercise easily as well as safety. This Marcy me 708 upright bike has a very nice and also attractive seat. The seat is adjustable with 9 different height positions so you can adjust it up and down as you’re necessary. The height of this seat is very comfortable and height adjustment is also perfect for individual body types. The seat designs with high-density foam. You can easily get on and also get off from the seat. You must satisfy with this seat when you will exercise. The pedal designs to provide maximum support for your foot when you exercise. The pedal has straps and also it’s adjustable. Pedaling is fully risk-free from any slippage. It’s very sturdy, stable and also quiet. The pedal doesn’t make any noise when you exercise. The pedal is 5 inches long and 4 inches wide. Q: Does the bike need a mat under it? A: No. This bike can be used on any flat surface. Q: Is the bike durable? A: Yes. Lightweight and durable. Steel tubing – 2″ x 2″ round 14 gauge tubing. Q: Is Marcy ME 708 fully assembled? A: No. You have to assemble this exercise bike. It is very easy to assemble by the step by step instructions. Q: Is this a small pedal diameter? A: No. The pedal is average. The pedal is 5 inches long and 4 inches wide. Same as a regular bike. Q: Is the Exercise Bike quiet? A: Yes. It is extremely quiet and the action is very smooth. Q: Is the display measuring distance in miles or kilometers? A: It’s measured in miles. Q: Does it come with a power supply? A: No. It’s not electric, it’s not necessary. There is a battery operated “computer” that gives you feedback while you are cycling, calories burned, number of minutes, odometer, etc. But your legs are the main power supply! Q: How is the resistance? A: Really good. Resistance levels are broad and easy to change mid-workout without stopping. Level 1 is essentially no resistance and Level 8 (max) is very difficult to sustain for long; I’m sure it’s perfect if you’re training for rides with an incline or you’re trying to build strength and endurance. Q: Is the bike easy to use? A: Yes, very easy. You can easily get on and off the bike. Q: Does Marcy ME 708 have an emergency brake? A: No. If you stop pushing the pedals, then it will stop easily and immediately. Construction of Marcy ME 708 Machine is heavy and weight capacity is also 300 lbs. Its weight is only 41 lbs. It also designs with adjustable magnetic resistance system with 8 levels. You can adjust from easier to hard workout manually. By 2.25 LCD monitor you can measure time, speed, odometer, distance and also calories burned. Pedals are smooth and also don’t make any noise. The seat is adjustable with 9 different height positions. 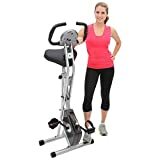 Finally, depending on these great features it’s easy to say this Marcy Exercise Bike is perfect for you and your family members. Even most of the customers’ reviews are positive; they rate Marcy me 708 Bike high and also recommend to others.